At 3.30 pm this afternoon, continuing the pastoral commitment of the Fridays of Mercy, the Holy Father Francis left Casa Santa Marta to visit the Emanuele alla Bufalotta Village, on the northern outskirts of Rome, accompanied - as usual in these visits - by himself Mons. Rino Fisichella, President of the Pontifical Council for the Promotion of the New Evangelization. The Villaggio Emanuele rises inside the Parco delle Sabine and is a structure dedicated to the care of people suffering from Alzheimer's disease, organized as a real village, which allows guests to live in normal conditions, reproducing many small aspects of daily life, necessary for those who live this difficult pathology to create and maintain a bridge of communication with the outside, promoting socialization and inclusion. The village is named after its founder Prof. Emmanuele F.M. Emanuele, Honorary President of the Rome Foundation, who with farsightedness did his utmost to find an innovative solution for residential care for people suffering from Alzheimer's. Upon his arrival, the Pope was greeted with astonishment by the residents and staff in the courtyard of the Village. The Holy Father greeted all those present, exchanging a few words of comfort with each of them. 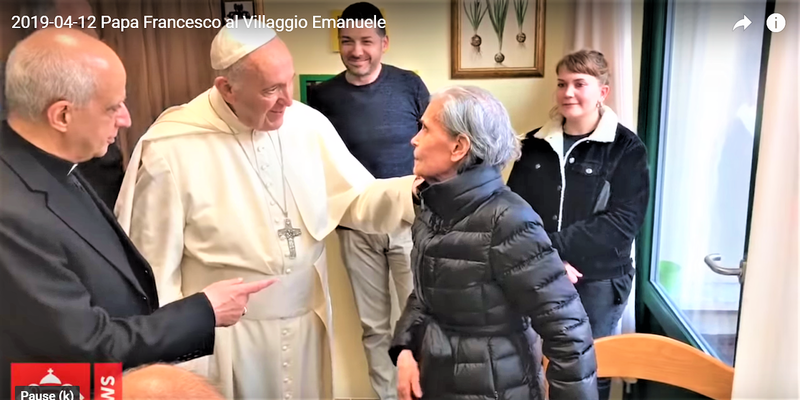 The residents, together with the honorary president of the Rome Foundation, Prof. Emanuele, and the current incumbent president, Franco Parasassi, accompanied the Pope to the various areas of the structure available to the residents: some guests who rested in their rooms received the unexpected visit and were able to spend time and exchange some words with Pope Francis; others, engaged in recreational activities, explained to the Holy Father their daily duties in the Village. The Pope's presence was lived by all as a gift and a moment of joy. With this visit, the Holy Father wished to turn his attention to the conditions of exclusion and loneliness that a disease such as Alzheimer's disease is likely to generate in people who are often left alone by society, creating strong disorientation, distress and suffering in the family The progressive increase in life expectancy also calls for greater awareness and respect for the needs and dignity of those who live this disease on themselves and those who are close to the patient. Before leaving the Emanuele Village, the Holy Father donated a scroll with a handwritten thought and a canvas depicting the Nativity. At the end of the visit, the Pope returned to the Vatican. Villaggio Emanuele, the only one in Italy, is born from the awareness that Alzheimer's has become a social priority and that therefore it requires the institution of a social-assistance model that can ensure a life as close to normality as possible, during the long course of the disease. The structure consists of 14 houses, each of which accommodates 6 people. In addition to the accommodations, there is a minimarket, a bar, a restaurant and a beauty salon that are available to residents. All these services were visited by Pope Francis during the visit. The Village is also open to the territory, in order to offer a stimulating environment, as close as possible to the external environment. Patients, simply called residents, can shop at the supermarket, help kitchen workers, take care of home management, thus maintaining a sense of reality and their own identity. Each accommodation is designed to be a family place, as close as possible to the home of origin, with spaces and furnishings designed according to the style that has characterized the life of each resident. In the structure there are various medical and social-assistance figures: health workers, social assistants, professional educators, psychologists, physiotherapists, nurses, in addition to the general practitioner. The operators help the guests to articulate, according to their needs, the daily experience in the Village. There are several activities on offer: art, music, sports, reading books, are just some of the activities that mark the day of the residents. There is no "typical day" for people living in the Village, as everyone is free to choose the course of daily life as they see fit. Assistance in both residential and semi-residential situations is completely free.